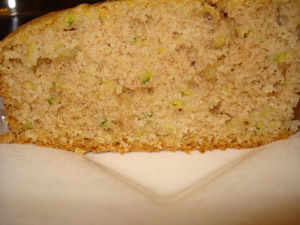 I don’t know why this recipe is called zucchini bread, since it is essentially a cake, a denser type of cake. I like this recipe since it is very simple to make, requires no special flours and uses oil (I dislike creaming butter!). 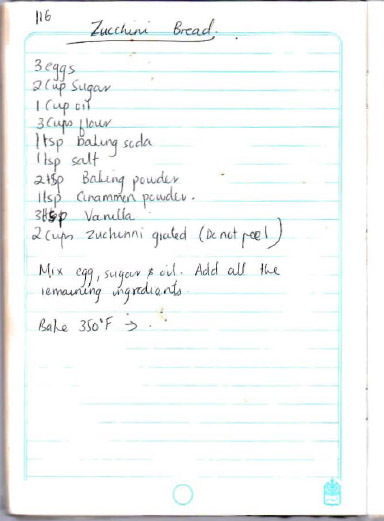 This is my sister’s recipe, I will be taking some for her at lunch (since we are lunch buddies!) and hope to get her stamp of approval! 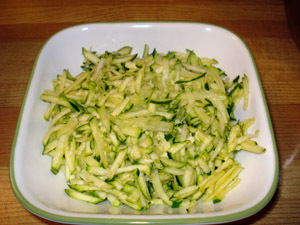 Grate about 2 small zucchini without peeling their skin. 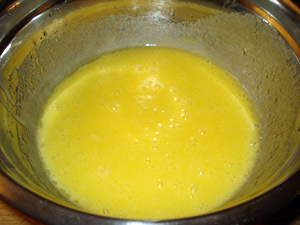 In a large bowl, mix together the eggs, sugar, oil and vanilla. If you have a hand mixer, use it to make a uniform mixture. Pre-heat oven to 350°F (175°C). Add flour, baking powder, baking soda, salt, cinnamon powder and mix well. 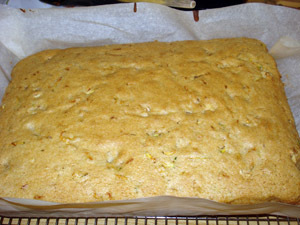 Add the zucchini and mix. Wait a two minutes, and mix again (the zucchini releases some water, so you want to mix that in). Add the nuts if using. 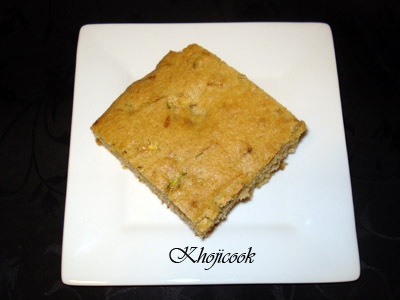 Grease or line with parchment paper your baking pan. I’m using a 9×13 dark coated metal baking pan. Bake on center rack at 350°F (175°C) for 35-40 minutes till tester comes out clean. 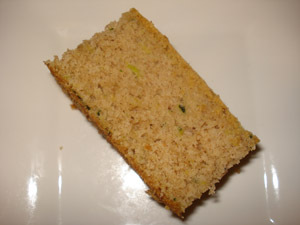 If baking in loaf pans, reduce cooking time. If you like the bread a little crispy on the top, turn off the oven and let it sit in the oven for an extra 5 minutes. the bread looks heavenly soulful & mouthwatering. Thanks for sharing the recipe i am your’s new follower I hope you will also follow my blog amazingshining.com which is just newly started about Tech Travel Food. Plz visit & like.